Michigan’s AuSable River is one of the finest trout fisheries in the nation. The AuSable’s productive water is made up of the North, South, and main branches. It is a large and diverse river. Prolific hatches, good numbers of trout, and great trophy quality trout, make this river a famous place. 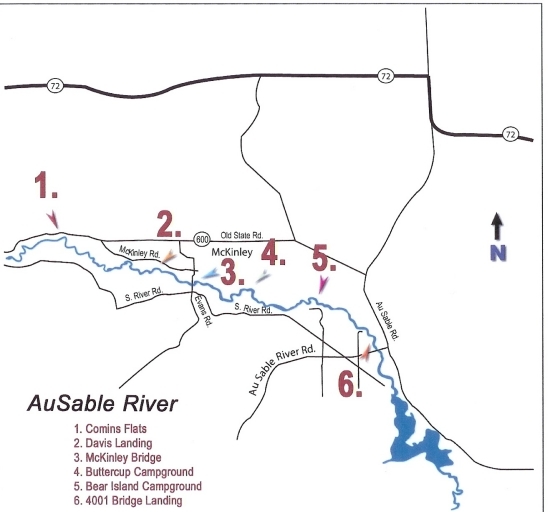 Special regulations have been placed in many areas along the AuSable River system. Why else would a name such as “The Holy Water” be placed on such a river? The AuSable flows for over 100 miles before meeting Lake Huron. Starting north of Grayling, The river flows south from its origin paralleling the Manistee River. 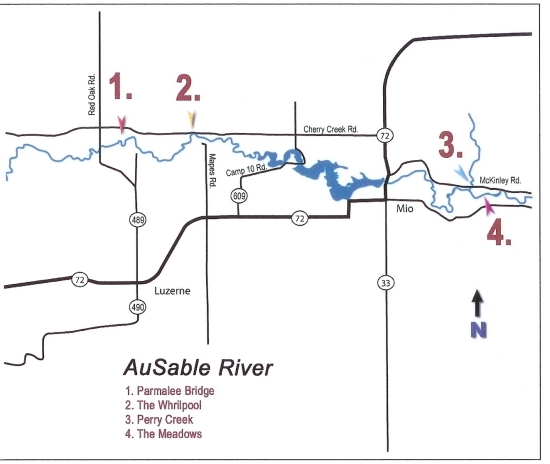 After running “side-by-side” for approximately twelve miles, the AuSable turns east and flows into Lake Huron while the Manistee turns west / southwest crosses the state and flows into Lake Michigan. The AuSable turns east and gathers the flow of the East Branch near the town of Grayling. A few miles east of Grayling, the river flows past Burton’s Landing, which is the start of the fly fishing only, catch-and-release section also known as the “Holy Water.” This area extends for nearly nine miles downstream to Wakeley Bridge. Within this stretch, the river consists mainly of sand and gravel. Beautiful trout filled pools, runs, and riffles litter this section. Many man hours have been spent making this a wade fisherman’s dream! This is a very productive and also popular areas due to the special regulations (catch & release) put upon it and from the diversity and shear beauty of the water. This special eight miles of river is not called “Holy Water” for nothing. Several access points are available for anglers to wade or float. Thendara Road and Stephan Bridge are popular areas with good access. The water is fairly large but easy to navigate and wade. Wakeley Bridge to Mio Pond easily equals the quality of the water from Grayling to Wakeley Bridge. The water is larger and deeper, and has more deep pools, structure, and runs for large trout live. Wading here is ok, but can be difficult. Good access points are found at The Whirlpool off of Cherry Creek Road and at Parmalee Bridge. Prolific hatches exist here and throughout the rest of the river. Caddis, Mayflies, and Stonefly hatches can be good to great in these waters. The Hex hatch can produce fish of 20” plus on a regular basis. From Mio Dam to McKinley Bridge, is known as the “trophy water” the river holds and produces an abundance of trophy size trout. Large browns and rainbow trout are in good numbers here, but are smart and can be hard to fool. Like the upper areas, quality hatches make it a wonderful stretch. The water is deep and strong in many areas, and is better fished with a boat. Hiring a guide will help to read this water and provide a fun and exciting way to fish this awesome fishery. A few good access points are located at Perry Creek, Comins Flats, and McKinley Bridge. The North and South Branches of the AuSable are also tremendous fisheries. They provide excellent angling with plenty of easily waded water. The South Branch flows northerly out of Houghton Lake towards the mainstream of the AuSable passing the area around Roscommon. It meets the mainstream around Wakeley Bridge. A section for fishing with artificial flies only, no kill is located from Chase Bridge downstream to lower High Banks. Brook trout browns and some rainbow trout can be found in this section of water. Access areas are numerous along the river providing ideal areas to “hop” out of your car and fish on foot. The North Branch flows southeasterly passing around Lovells eventually emptying into the mainstream a few miles downstream from the South Branch. The North branch is also a quality fishery with a section devoted for fishing with artificial flies only from Sheep Ranch downstream to the confluence with the mainstream. This is a beautiful river with good pools and good sized trout. This section of river is also good for hatches, and good number of bugs. Access is good, and many areas along the North Branch’s path can be found to fish. 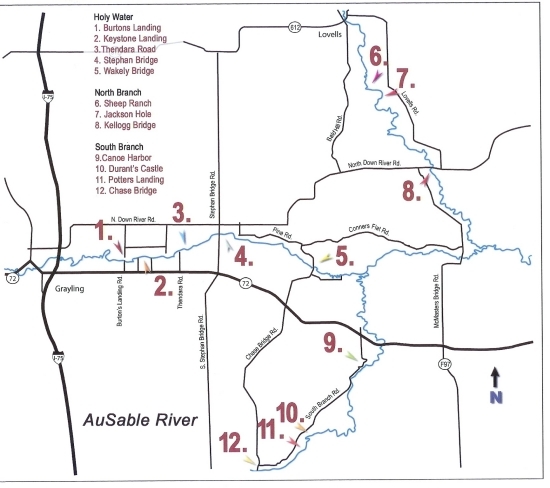 The lower AuSable River from Foote Dam to Lake Huron is a steelhead and salmon fishery. The river here is very large and should be fished from a boat or from the banks. Careful wading is a must and a boat and guide are recommended and will provide the best angling. Steelhead fishing is available from late fall through early spring, and salmon fishing in the fall. Although the access and wade fishing is good on this river, the use of a guide will always provide a safe, exciting educational experience, and put you on the best fishing the river has to offer at that time of year. · Daily Harvest Limit - 5/3* * 5 fish, with no more than 3 fish 15 inches or larger, and no more than 1 Atlantic salmon. · Brook Trout 10", Brown Trout 12", Rainbow Trout 12", Splake 10", Lake Trout 24", Coho, Chinook, & Pink Salmon 10", Atlantic Salmon 15"
· Type 7 - All year. No-kill, catch and release only. ** Artificial flies only. 0 (zero) daily possession limit. · **Trout may not be possessed on type 7 streams regardless of where caught. 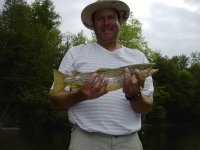 · Possession Season - Brown trout, Brook trout, Atlantic salmon Last Saturday In April - September. Other species all year. · Brook Trout 10", Brown Trout 15", Rainbow Trout 15", Splake 15", Lake Trout 24", Coho, Chinook, & Pink Salmon 10", Atlantic Salmon 15"
· Possession season - All year.